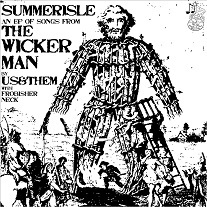 Us & Them chose four of the most representative and most recognisable tracks from The Wicker Man soundtrack and gave them their own stamp of identity. They open this EP with the Scottish traditional song Corn Rigs and follow with Fire Leap. Both pieces follow the original closely, although there is a great deal more dreaminess in the music of Us & Them. It's as if the music of Paul Giovanni simply called for these improvements. The continuation is even grander, with even more keyboards, in particular the Mellotron. The music stays pretty close to the original, except that some strings are replaced by keyboard instruments, such as the Mellotron, played by the excellent Frobisher Neck (Tony Swettenham). I also enjoy the wonderful use of the dulcimer, which is definitely an underutilized instrument in modern music – such a wonderful sound. If you enjoy acoustic folk music with a touch of psychedelic bliss, Us & Them certainly know how to tickle your fancy. It’s not always easy to do an album (even EP) of covers because there’s always a danger of mucking it up. Us & Them have managed to stay pretty faithful to the original and still added their unique style as well.